Getting all the ingredients prepped and ready to go. South Africans, the Caribbeans all have curry dishes, and many taste wildly different from the others. So tell me you don’t like Brussels sprouts, but don’t tell me you don’t like curry until you’ve tried all different kinds. Even in my India cookbook there’s 1,000 recipes. So there. All right, so enough beating up my audience! Let’s get down to brass tacks. This curry, believe it or not, was inspired by Diners, Drive-Ins and Dives with the ever irritating Guy Fieri. 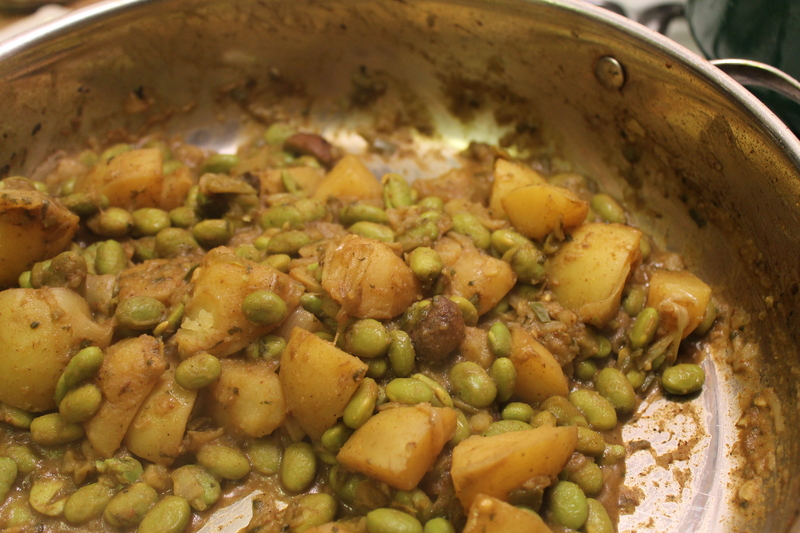 He showed a woman from Trinidad in Milwaukee cooking up this amazing potato and chickpea curry. It was vegan, and you could tell that GF honestly liked it. I knew my mouth was watering, but I had to get around the chickpeas. The Husband does not like chickpeas unless they are transformed into hummus, in which case he’ll eat it all. Go figure. Edamame, straight from the bag. I was going to use fresh peas, but the ones I found at Whole Foods looked old. 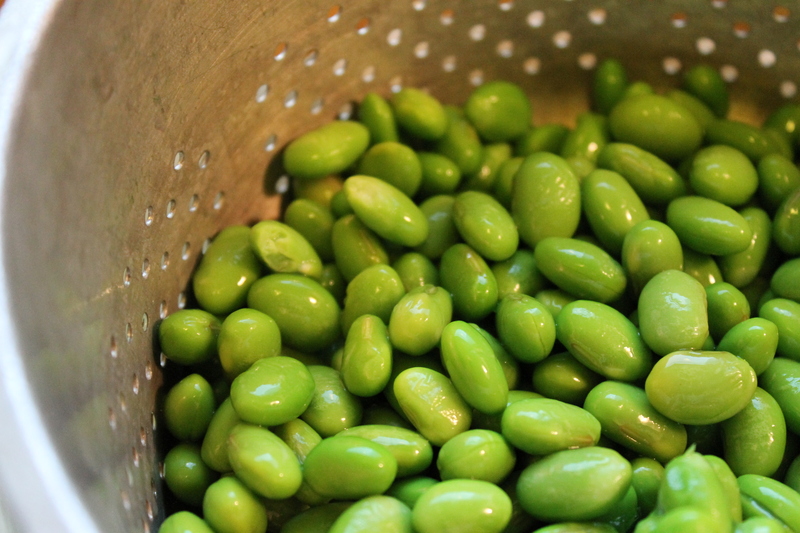 I thought I’d try edamame, which worked quite well, but I think next time I’ll try a white bean like cannellini or navy. They did add a nice color to the dish, for sure. I also threw in some mushrooms just because they were in the fridge, and I’m glad I did. This recipe is inspired by one from a website called the Caribbean Pot, but it’s different. I couldn’t help changing it up, and I couldn’t find habaneros. And Triple D only posted Marla’s oxtail recipe, not the curry recipe. Next time, I will try making my own madras curry powder, but this time I just used a pretty standard yellow curry powder I found at Nina’s Grocery. This recipe seems infinitely changeable as long as you get the sauce right. I’m adding a little more water to the recipe than I made it with, as it came out pretty dry, and we like our curries saucy! Chiles and spices and cilantro—oh my! Get all your ingredients prepped before starting, as it makes it a lot easier as it gets going. 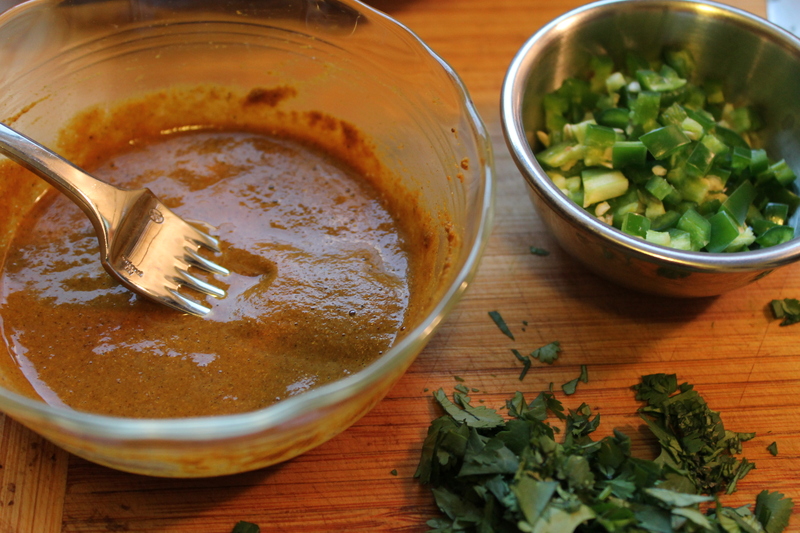 Put the curry powder and the cumin into a small bowl and add two tablespoons of water. Stir to make a paste. Cooking down the curry. Apparently, it tastes better this way, and I’m not going to argue. Heat two tablespoons of coconut oil over medium-high heat in a large pot or high-sided frying pan, one that has a lid. 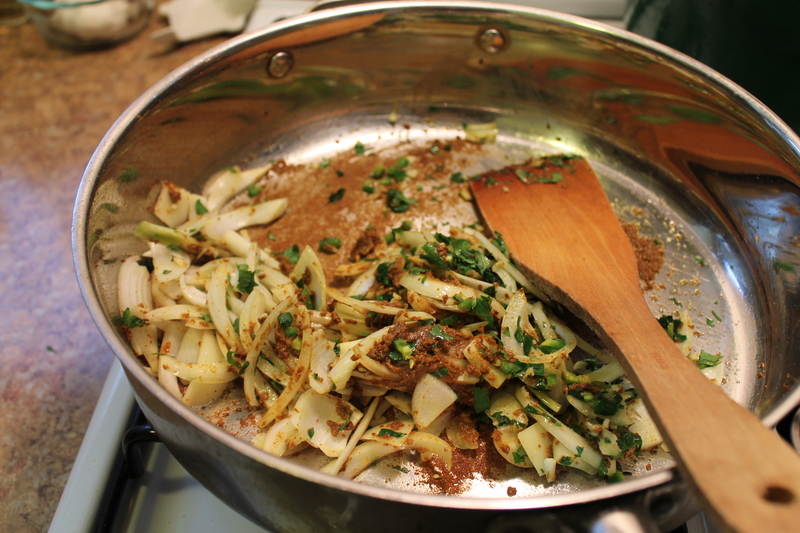 Add the curry paste and stir; let it cook for about two minutes. Once those wonderful aromas really permeate the house, add the onions, cilantro, chiles and garlic and keep stirring for about four minutes. Add another four tablespoons of water during this time to make sure it didn’t burn. Once the onions are nice and soft, add the potatoes and stir well, making sure they’re all coated. Add the edamame and stir well. Add the 3 cups of water, bring to the boil then turn down to simmer. Cook for 10 minutes and add the mushrooms. By about 25-30 minutes, the sauce should have started to thicken a bit. I took the Caribbean Pot’s advice and broke up a few potato pieces to give a little more body to the sauce. 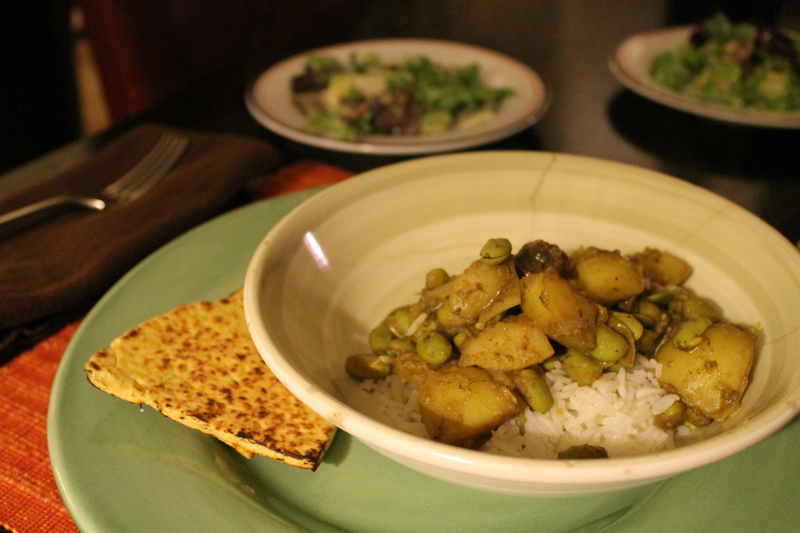 Served with basmati rice and naan, it’s a lovely, warming, but not-too-heavy meal. Serve with naan bread and basmati rice with a little Earth Balance stirred in at the end for flavor. This is one curry you don’t need pilau rice with! * Please adjust according to taste. This was probably a 6 out of 10 on spice. And now for more Virtual Vegan Potluck! Use these buttons to continue “sampling” the other dishes on the virtual potluck table, and enjoy! This is a virtual potluck, so please click to see who was in the chain before me: It’s the Vegan Kat! Go forward and see what main course the Toxic Vegan has whipped up! This looks wonderful! 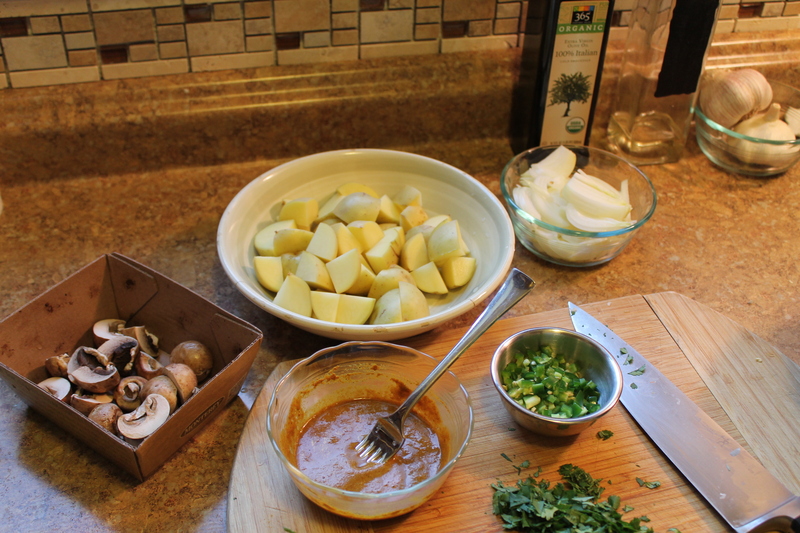 I love potatoes in a curry, they soak up the sauce and spices so well and the texture of them when they’re all soft and coated in curry sauce is delicious. Yum! I like the beans too, it all looks very satisfying. Thanks! And it was. There’s nothing like curry for a comforting meal! Haha – I had to stop for a minute to laugh at the “irritating Guy Fieri!” So, I’m not alone! Never mind that…the recipe is gold, Jennifer, gold! And knowing it’s Husband-approved seals the deal!! Now, get to work on your recipe for the NEXT VVP! No, you’re not alone about GF, but I love how he finds these gems of restaurants where people are cooking their hearts out (sometimes literally, with all the meat and fat, but oh well!). I agree! I’d always had Brussels sprouts overcooked and mushy. My recipe with green apples, caramelized garlic and toasted almonds can convert just about anyone. Awesome, I have TVP fakin bacon in my pantry! Thanks!!! Truly, it doesn’t even need it! The caramelized garlic gives it such a good flavor. But let me know how it goes with the fakin’ bacon, I’d love to know! Thank you! I can’t wait to get started…it’s been a busy weekend with Mother’s Day and all! Well, we would get along famously! I love curry!! Can’t get enough of that stuff. I did try a curry veggie from a restaurant recently, and I had to doctor it up a little because I needed MORE curry flavor. Yum! I’d have to leave out the mushrooms, but that’s one of the great things about this potluck; it’s given me inspiration to adapt. Thanks for sharing! I”m bookmarking this, thanks for sharing! Thank you–that’s such a wonderful compliment! I hope you enjoy the curry as much as I did! I love mushrooms! Thank you for this great recipe! I’m always a humongous fan of curry (in fact, I’m posting a curry recipe today!). It’s so versatile, healthy and filling. Yours looks delish – curried potatoes for the win! “The husband” wasn’t this fussy when you were dating, was he? Looks delicious! I don’t cook much with edamame so this is inspiring me to do so. Don’t forget the original recipe had chickpeas, which I think I would have preferred just a little bit, because of their creaminess. But the green looks so good!